Saint Paschal of Baylon was born on the feast of Pentecost in the year 1540 at Torre Hermosa in Spain. His parents were poor in worldly goods but rich in piety and Christian virtue. The child appeared to be endowed with all the gifts of the Holy Spirit in an eminent degree. He was joyfully attentive and obedient to the good lessons his parents taught him, and he so excelled other children of his age in understanding of the divine truths and zeal for virtue that everybody marveled at it. As the lowly position of his parents demanded, Paschal, already as a boy, had to tend the cattle of strangers. Although, due to his work, he took no part in the noisy life of the other boys, he was, never the less, well liked by them. They had a certain respect for him, had him settle their quarrels, and willingly accepted reprimands from him and listened to the Christian instructions he sometimes gave them. His employer was so pleased with Paschal, who had meanwhile grown to be a strong young man, that one day he declared to him his intention to adopt him and make him his heir. But the young man answered gratefully that he wished to remain poor and was minded to consecrate himself to the service of God in the religious state. 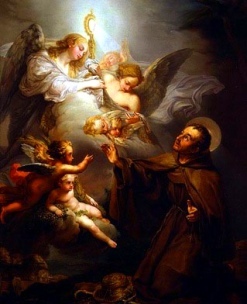 Later, Saint Paschal of Baylon moved to another province, and at the age of 24 begged for admission as a lay brother at the convent of the Friars Minor at Monteforte. His request was granted, and Paschal seemed to run the path of perfection with ease and alacrity. 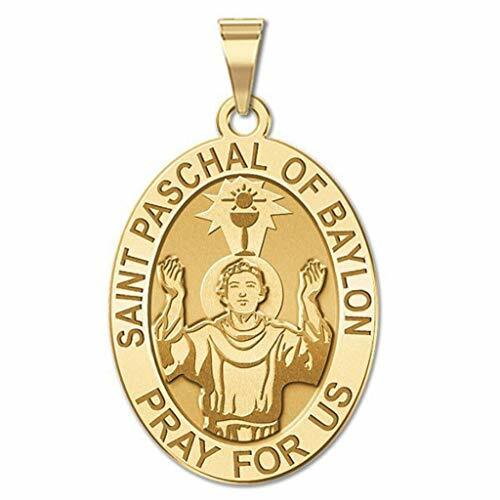 Saint Paschal of Baylon was so humble that he considered himself last of all. At the same time he was so charitable that he cheerfully assumed the most burdensome duties from other brothers. He was so strict with his body that he would permit himself no relaxation even with the most arduous tasks. He was so devoted to prayer that he spent all his spare time at it. On the road, while gathering alms, Saint Paschal of Baylon always had his rosary in his hand and God in his heart. Paschal fostered special devotion to the Blessed Virgin Mary, whom he called his Mother, and to the Blessed Sacrament, and it proved a constant means to rekindle his zeal. God showed how pleased He was with Saint Paschal's devotion. One day while out-of-doors, Saint Paschal of Baylon devoutly knelt down to adore the Blessed Sacrament when the bell announced the Consecration. At that moment the Blessed Sacrament was presented to him in a monstrance supported by angels hovering in the air. In the convent church Saint Paschal of Baylon was frequently found before the tabernacle prostrate or with his arms outstretched, or even rapt in ecstasy. At such times his soul was flooded with light from above. At any rate, the simple brother, who had never learned to read or write, could discourse about the deepest mysteries of religion with marvelous insight to the astonishment of the most learned men. Because of his heavenly enlightenment the Father Provincial once sent Saint Paschal from Spain on a very important matter to the general of the order, who at the time was staying in France. Paschal made the long and wearisome journey across the Pyrenees barefoot, traveling through regions infested with fanatical heretics, who on several occasions sought the life of the religious brother. God's angel protected him on the journey to France and back, so that he escaped all danger. After his return, Paschal remained the same humble brother as before and advanced in every virtue until the day of his happy death. He died at Villareal, on the feast of Pentecost, the feast on which he was born, May 17, 1592. It was during high Mass in the convent church, at the moment of the elevation of the Sacred Host, that Paschal breathed forth his last. At the funeral, according to custom, the body of the deceased brother lay on an open stretcher in the church. When the Blessed Sacrament was raised in the Requiem Mass, the dead body raised itself, bowed to the Sacred Host, repeating the act of reverence at the elevation of the Chalice, and then lowered itself again. Eleanora Jorda y Miedes, who was there, stated: "I went up to Brother Paschal as though he had been alive, kissed his hands and feet and saw the miraculous dew upon his forehead...When I saw him open his eyes at the Elevation, I was so astounded that I gave a loud scream." They body of St Pascal Baylon was intentionally covered in lime in an attempt to rapidly destroy his remains. This was done so that there would be no offensive odor from the decomposing body when the crowds that continued to arrive should view his body, and because someone thought that the white bones would look more impressive. Miraculously, the lime had no effect. Father Ximenes was there when the body was later exhumed. "The lid was raised and we all approached the shrine and attested the presence of the crust of lime which concealed the saint from sight. I would not allow anyone else to have the honor of removing this crust; but detached it bit by bit, beginning with the portion which covered the face." "O heavenly joy! In proportion as I lifted the veil, the features of our blessed brother were disclosed, full of life and animation. It was indeed himself, miraculously preserved in the flesh; intact from head to foot, even down to the tip of the nose, ordinarily the first part to show signs of decomposition." "When we raised the eyelids, the eyes seemed to gaze at us and smile. The limbs were so supple and flexible that they lent themselves to every movement we imparted to them. Nothing recalled death, or the presence of a dead body; on the contrary everything breathed life and brought consolation and joy to the soul. Human language is inadequate to portray such a spectacle." Numerous other miracles occurred at his grave. Pope Paul V beautified Paschal and Pope Alexander VIII canonized him in the year 1690. Pope Leo XIII in 1897 made Saint Paschal of Baylon the patron of all Eucharistic societies and congresses. 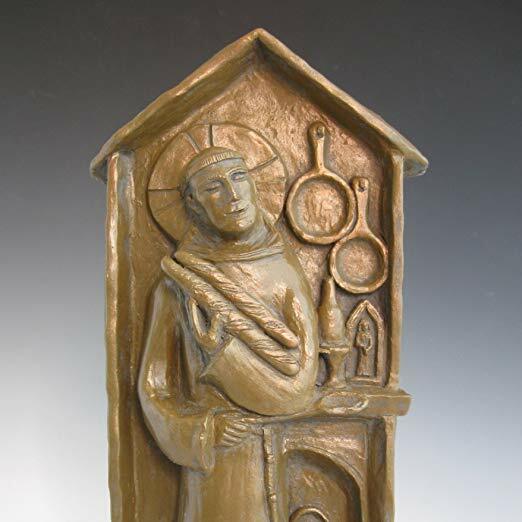 You can cook with a saint: in a kitchen at home or restaurant. I design, carve, and cast the pieces myself. I cast them in modified gypsum with bronze powder. The pieces come boxed, can stand or hang (there's a hook on the back), and can go outside (by a grill). Each piece comes with a history card stating: "Paschal Baylon (1540-92) was a Franciscan lay brother. Born on the border of Castile and Aragon of a poor shepherd family, he tended flocks as a youth. In his early twenties, he joined his religious order. His charity to the poor and afflicted and his humility and courtesy were extraordinary even by Franciscan standards. He worked as a gardener, doorkeeper, and cook, feeding the other friars and vast numbers of the poor who came to the door of the friary. His ability as a baker and cook–his capacity to take simple ingredients and make delicious food–became legendary. Poorly educated, his counsel was sought by the rich and poor alike. In this image, Paschal is shown at work in his kitchen, assisted by St. Martha, another patron of cooks (her image is in the tiny niche on the mantel). The piece was hand carved by Hank Schlau and cast by him. It was then hand painted by Karen Schlau." Dimensions: 9 (h) x 4 (w) x 2 (d) inches. If you have any problem with the piece, let us know, and we'll resolve the matter as quickly as possible.